Choosing an eye liner can be tricky. There's lots of different types, not to mention brands, so as a complete liner addict I wanted to outline what I think each liner works best for. Pencil liners are great for a subtle line along the top lashes, and also for on the waterline. They normally come in a wide variety of colours making them perfect if you love experimenting with your eye makeup. They usually last forever as you can sharpen them over and over again, but can be annoying if they go blunt on you and you can't find your sharpener! I'm loving Inika and Urban Decay right now. Like a pencil, only minus the wood, these are usually contained in plastic tubes that twist up to reveal the actual liner. These are great as they don't need sharpening, making them perfect for travelling, plus usually smudge quite nicely if you want a smokey effect. Good ones should go on smoothly, with no dragging. My current favourites are by Chanel and GOSH. These are slightly less available, but the Bourgois kohl crayon pictured above is a nice example. Kohls are usually used for a more smudgy, smokey effect and are a little harder to get a very fine, neat line with. Definitely something to use for 'rock chick' eyes. Liquid liners are really versatile. Perfect for getting a vintage flick, they offer a good choice of thickness. Application can take a bit of practice though and some of them have a tendency to flake as the day wears on. Most usually come with a little brush inside the lid which is used to apply the liner. I don't use these very often, but Rimmel make a really good budget buy which I've repurchased several times over the years. For me these are the perfect liner. 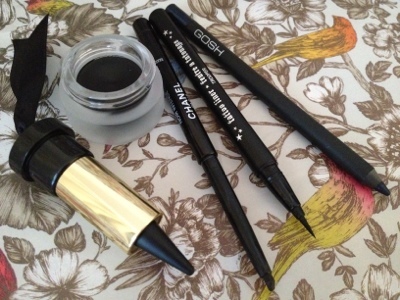 All of the look of a liquid liner, but much easier to apply. Some brands offer a thin tip and a thick tip to help control the thickness of the line. Because these don't have a reservoir pot like liquid liners they can dry out, but if you store them on their side this usually makes them last a lot longer. I've tried a lot of felt pen liners and the best ones I've found so far are by Hourglass and NARS. Gel liners come in little pots and are applied using a brush. These can be used to give a very fine line to enhance lashes, or built up for a thicker, more defined look. I think the success of a gel liner really comes down to your brush skills, and I struggle to get fine lines with these as I'm a bit heavy handed. Again, good ones will last all day, but they can have a tendency to dry out and flake a little in my experience. Don't leave the lid off, or you'll come back to a dried out lump! The Topshop one pictured is pretty good, and Bobbi Brown make a great range of colours in their gel liners. What's your favourite type of eye liner? Urban decay do the best pencil liners and so many gorgeous colours (purple being my current fave). I like to do 'flicks' from top lash line outwards and I find gel liners are the best for that :) currently using bourjois and have no complaints. The felt pen markers are definitely my favourite. I like a nice defined line rather than smudgey liner. The Revlon Colour Stay eyeliner pen is great. I really love eyeliner pens. They're perfect for me because I'm not very skilled in the make up department and they're really easy to apply! I've got a black one form no.7 and it's been really great for me! I have all types of eye liner haha I'm just addicted and like to have all options!